Ingredients: Hemp Seed Oil- Complete in Omega 3,6,9, Vitamins & minerals, easily absorbed into the skin providing natural healing qualities. Sweet Almond Oil- rich in cell replenishing vitamins, nourishing tired lifeless skin. Avocado Oil- Expressed from the fruit of the Avocado rich in vitamins A & D and potassium. Great for the treatment of Sunburn & minor burns, nappy rash and eczema. Evening Primrose Oil- this highly emollient oil helps clear skin blemishes, soothe irritations and soften wrinkles exaggerated by dryness. Evening Primrose oil aids in the repair of skin tissue and helps maintain the softness and suppleness of youthful skin. Used for the relief of eczema & psoriasis. Jojoba Oil- This unique product is technically a liquid wax. Use for the temporary relief of eczema & psoriasis. As a skin conditioner Jojoba leaves the skin with a lustrous velvety bloom. Rich in Vitamin E – this oil is great all over the body. 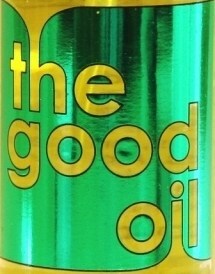 DIRECTIONS FOR USE “The Good Oil” is packaged in a handy 135ml pump application bottle. Apply 3 to 4 pumps to the face & neck for maximum results. 1 spray pump to each section of the body is required to obtain suppleness and anti-aging effects.